Mobile data traffic has exploded around the world as tablets, smartphones, and cellphones have proliferated to every corner of the globe. Each year, Cisco releases its updated Visual Networking Index (VNI) survey, which includes data on the volume of mobile traffic. Cisco VNI combines analyst assessments and direct data collection to forecast anticipated mobile data growth. We retrieved data from Cisco VNI forecasts for the years from 2009 to 2014. In looking at its projections, their forecasts show a high rate of mobile traffic growth, but at decreasing rates each year. 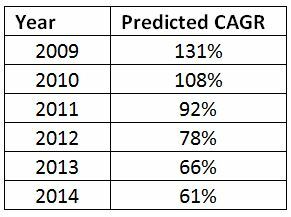 Table 1 shows the Compound Annual Growth Rate that Cisco VNI has reported (see the links below for each year’s report). From this, we can see that Cisco has dropped its mobile growth projections from 131 percent in 2009 to 61 percent in 2014. The reason these numbers are important is that variations in Compound Annual Growth Rates have tremendous implications in terms of longterm projections. For example, Figure 1 depicts Cisco VNI forecasts for mobile traffic growth at different levels of growth. If one extrapolates each of those projections through the out years, one can see significant impact on the numbers. For example, a growth rate of 61 percent leads to a 2018 forecast of 16 exabytes per month, while one of 131 percent generates a 2018 forecast of 143 exabytes per month. The clear implication of this analysis is that researchers should be cautious about five-year projections. Small differences in compound annual growth rates produce very different numbers in the out-years. They lead to very different needs in terms of infrastructure development, private investment, and spectrum policy. It makes a big difference whether the world expects 16 or 143 exabytes per month of mobile data traffic in 2018. Sonia Vora contributed to this post. Data retrieved from the Cisco VNI forecasts for the years 2009 to 2014. See table below for links.